Apologise for the very late post. This story has been in the draft since forever. I forgot about it and did not manage to finish it. This is the story of our Hong Kong holiday, 2 years ago. Haha! Because it’s been 2 years and I don’t really remember the detail of the journey so I will make it short and quick. Here we go. It was a long overdue holiday. After so many things happened in our life, after so many consideration and priorities in life, we finally managed to go on a holiday. We chose Hong Kong because it’s relatively close to Singapore, the flight was just around 4 hours, it was on winter, which I like and the main reason was that we wanted to go to Disneyland! We went to Hong Kong with my sis in law, Pepi and her husband, Arief. The itinerary was all basic I think I don’t need to write it down because when you google it, you will easily find so many insights, stories, and review about it. We booked an apartment from Airbnb in Jordan area and stayed there for 3 days. We also managed to go to Macau during those times and spent the rest of the holiday in the Disneyland area. The first day was not too cold. It was around 19° when we arrived and we were okay with just one layer of a sweater. It is said that the weather will be around 18° to 20° throughout the week. But then when we went to Victoria Peak that night and the weather dropped had already to 13°. That’s it, the weather was never warm again until our last day that I needed to buy a thicker jacket. The highlight of this holiday, for me, was actually Macau. At first, I underestimated Macau. I thought that half day in Macau will be enough, but I was wrong. Macau is so pretty. It reminds me of my hometown Magelang. Everything was so calm and beautiful. We rented a van to go around the town. The driver took us to so many places. But the time was limited, at 5 pm, we were already at the harbor to go back to Hong Kong. I want to come back to Macau, one day. Lemon’s highlight was absolutely Disneyland. There was this one particular event that we will always remember. It was in the afternoon, the weather was so cold, we were queuing to take photos with Minnie Mouse. It was a long queue. Everybody was so patient, including Lemon. I tried to tell her that it’s gonna be long and maybe she wanted to try something else but she insisted to join the queue. After like 60 minutes, it was finally our turn. She ran through the crowd and hugged Minnie Mouse, she did not want to let go. Everybody was smiling, Minnie Mouse and the staff were so nice, they let her hug longer and took some more photos. She looked super happy. I think that was one of her dream that came true. We stayed at the Hong Kong Disneyland Resort that night and bought the breakfast with the character package. Apart from the pretty princessy room that we stayed in, it was also Lemon’s favorite because she had breakfast with her favorite characters from Disney, even me was so excited. 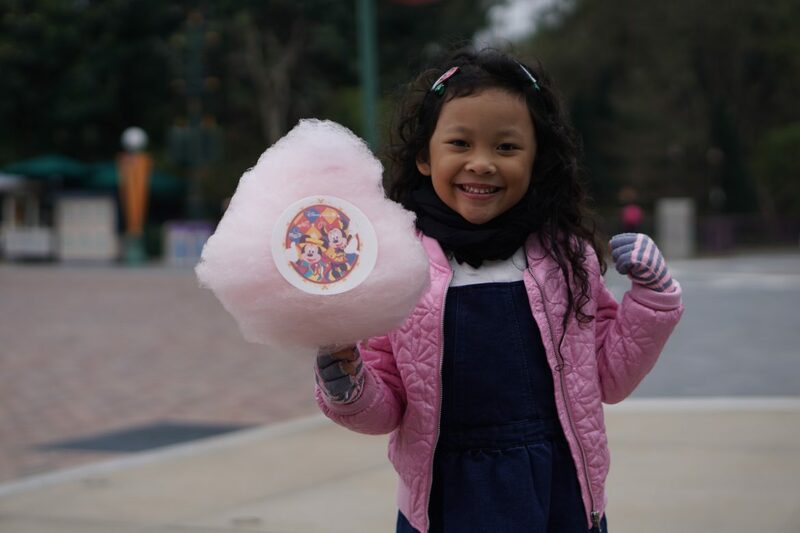 That was our first-time experience in Disneyland and surely the memories stay. We flew back to Singapore in the afternoon smiling ear to ear. We were so tired indeed but also felt so happy. Even Lemon was so easy for the whole week. Alhamdulillah. As for now, 2 years later, I am writing this while still thinking to go to Hong Kong again someday. Maybe we should spend at least 2 nights at the Disneyland Resort.